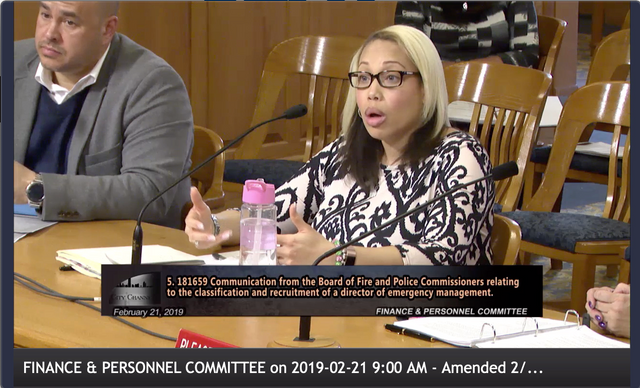 Milwaukee Alderwoman Milele Coggs let the cat out of the bag at the Milwaukee Common Council’s Finance & Personnel Committee Meeting on February 21, 2019 (beginning at 48:00) when she broached the subject of the imminent departure of the Milwaukee Fire and Police Commission's Executive Director, La Keisha Butler. Director Butler was approved by the Common Council in May of last year and faced daunting challenges. It is hard from the outside to understand the scope of the difficulties she encountered but staffing was a major problem. Mayor Tom Barrett has not reappointed the current Chair of the Board, Commissioner Marisabel Cabrera, nevertheless she continues to serve. The Common Council rejected the Mayor's appointment of Walter Gielow and it was only through the adroit maneuvering of Alderman Bauman and Alderman Rainey that the Council approved Everett Cocroft's nomination. Commissioner Ann Wilson's term expired in 2017 and the Mayor has not appointed a replacement for her yet. The Board of Commissioners is currently at the statutory minimum of 7 and it really needs the full compliment of 9 given what's on its plate. The Fire and Police Commission needs a new office space where they can all work together, conduct interviews and handle complaints. This has been in the works since 2016 and Director Butler did make progress toward that goal. The FPC has implemented 3 out of the 20 recommendations suggested in the DOJ Report "Collaborative Reform Initiative Milwaukee Police Department Assessment Report" so there is plenty of work remaining there. 21. It is my opinion that the FPC’s failure to provide proper oversight of and guidance to the MPD on its policies and practices related to stops and frisks, accountability for officer misconduct, and community relations is a problem that has existed for some years. A 2006 report by the Police Assessment Resource Center (“PARC”) found that the FPC “underutilizes its policy review powers.” The PARC report recommended a “fundamental overhaul” of the FPC. Yet, there is no evidence available to the author of this report that any such “overhaul” has occurred. It is also my opinion that PARC is one of the most highly respected independent consulting organizations in the field of law enforcement, with a wide range of experience, and that its judgment carries great credibility. Although her departure from the FPC has not been reported in the mainstream media, it was made unequivocally clear by Maria Monteagudo, Dept. Employee Relations, during the Feburary 21 Finance Committee meeting, that Executive Director La Keisha Butler is leaving. The Milwaukee Fire and Police Commission is in a world of hurt at a time when the People really need it. I made an assumption that Executive Director La Keisha Butler was leaving because of issues related to the job but that is not the case.